Or, three days in London. We wanted to see an exhibit (me) and a Vermeer (Alison), so we searched for hotel and flight packages on a whim. 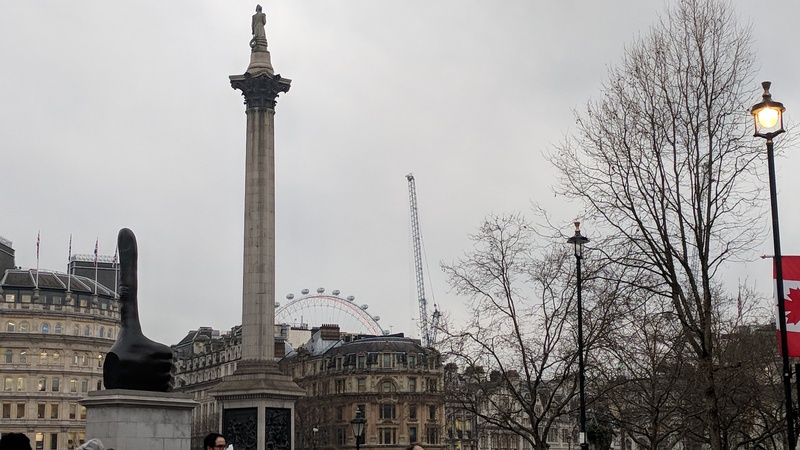 It turned out that we found a great deal – around $930 – for three nights at the Thistle Hotel Trafalgar Square and a round trip flight on Virgin Atlantic from Dulles to Heathrow. I guess, for some reason, no one much wants to visit London in January? They are foolish! So off we went for a long week-end. The flight was uneventful, fortunately. We both had carry-on bags that fit the teensy dimensions required by international flights (though VA seems a bit loose about this), so we were able to get off the plane and go right to a cab. The trip was fine until it slowed way down due to traffic restrictions related to the changing of the Guard (per the cabbie), so it cost a bundle. Oh, well, dropped our bags, picked up a quick sandwich lunch at Pret a Manger on the Square, and returned to the hotel for the necessary two-hour nap. Above is the Square as it looks these days, with the (newish) London Eye in the background and a new sculpture in the foreground. No worries, the pigeons, the fountains and the people making chalk drawings are still the same. The Pentecost by Giotto is one in a series whose parts are scattered across the continent. This one portrays the tongues of flame the apostles have as they are filled with the Holy Spirit. I was particularly taken by the two observers who are admiring the words. 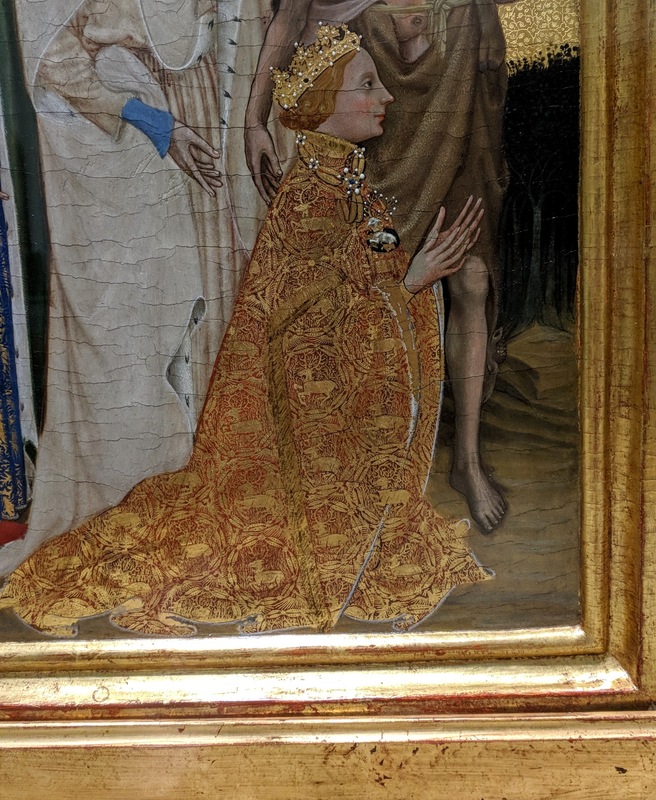 This is a detail from the Wilton Diptych, one of the great treasures of the National Gallery. It was commissioned by Richard II for his private devotions, and he is the man kneeling. 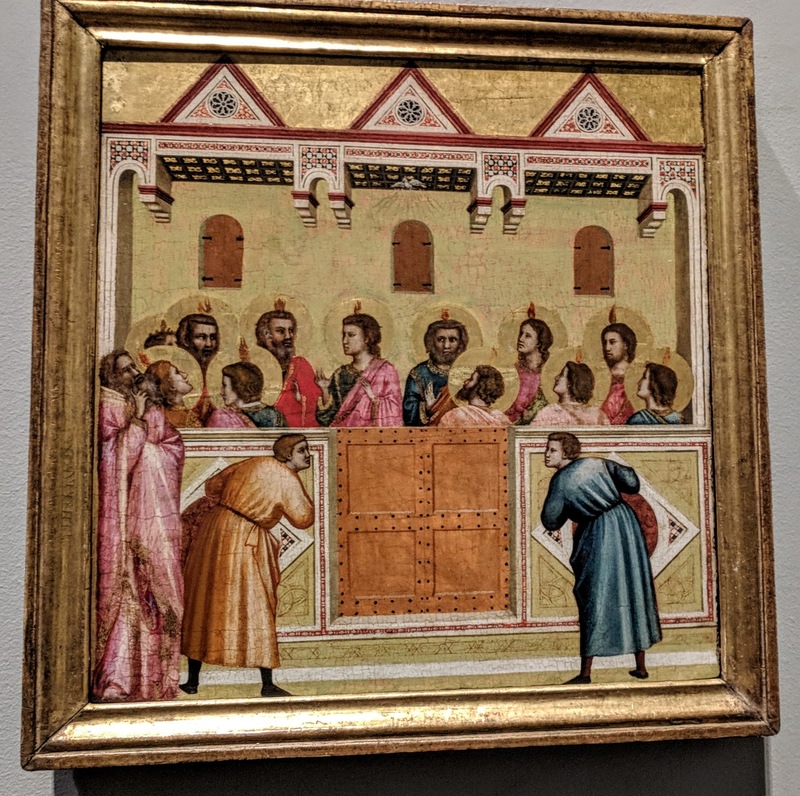 There are many details whose religious or historical meanings are well described in The National Gallery Companion Guide, or here. It is not very big but absolutely beautiful. 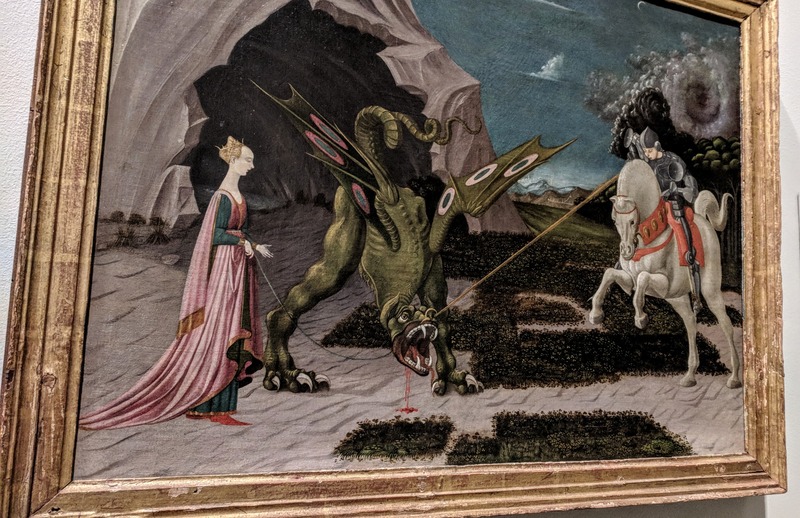 I loved the Late Gothic style of Uccello’s St. George and the Dragon. It inspired poet UA Fanthorpe to write “Not My Best Side,” from the viewpoint of the dragon, the maiden and the saint. Notice her pointy shoes. 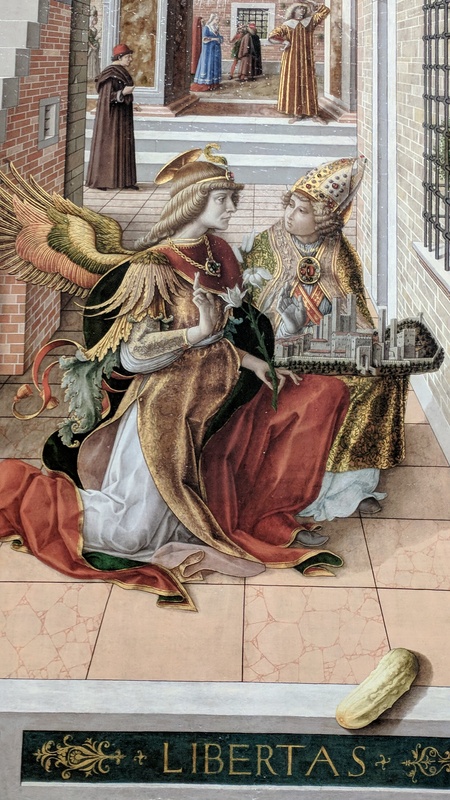 And here is a detail from Carlo Crivelli’s Annunciation. The whole thing is quite bustling, commemorating the day when the city was granted limited self-government, so the city itself is featured in the model held by the local bishop. The Angel Gabriel looks quite business-like, landing as he has in the middle of the street to bring the good news. The pickle has puzzled many viewers and appears in many of Crivelli’s works. Here’s a summary of some of the interpretations. 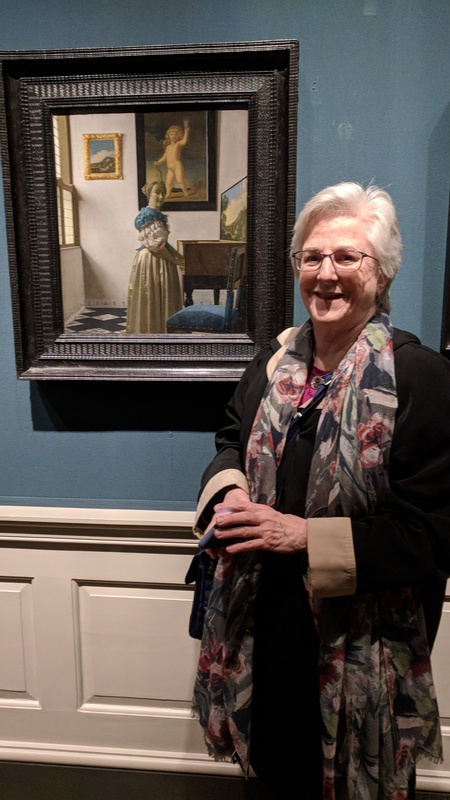 Although this is not THE Vermeer Alison came to see, it’s always good to revisit old friends. This is A Young Woman Seated at a Virginal. An adequate dinner in the hotel restaurant, and an early bed. Anticipating tomorrow’s visit to the BM and the Scythians! This entry was posted in art, London, pickles. Bookmark the permalink.